Rare Gem in the Forest! Set on a Treed Lot in Beautiful Highland Pines, Offering 3 Bedrooms, 2 Bathrooms Plus a Lower Level Bonus Room With Wood Burning Stove. Constructed in 2007, This Home is Super Clean and Features Finishes Like Quartz Countertops Throughout, Engineered Hardwood Floors and Ceramic Tile Floor in All the Right Places! Master Retreat is on the Main Level and Offers a Walk In Closet, Master Bath with Shower and Double Sinks. Open, Great Room Concept with Wall of Windows and Sliding Glass Door to the Deck. Relax on the Deck, Made of Trex Material, and Enjoy the Under the Trees and Mountain Views! Generous Laundry Room with Pantry Shelves. Oversized 2 Car Garage with Workshop. Approximate size: 16553.00 sq. ft. Please, send me more information on this property: MLS# 5870130 – $440,000 – 1115 N Turkey Run, Prescott, AZ 86305. 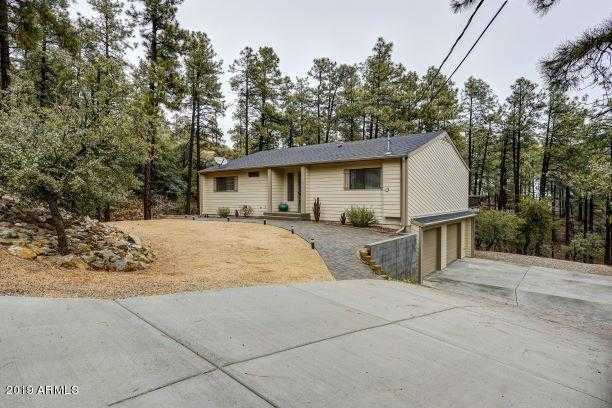 I would like to schedule a showing appointment for this property: MLS# 5870130 – $440,000 – 1115 N Turkey Run, Prescott, AZ 86305.